NHTSA Will Look At Tesla's Autopilot Mode, After Deadly Car Crash : The Two-Way The fatal crash of a Tesla Model S car that was in autopilot mode when it collided with a truck on a Florida highway last month is prompting a preliminary evaluation of the feature. 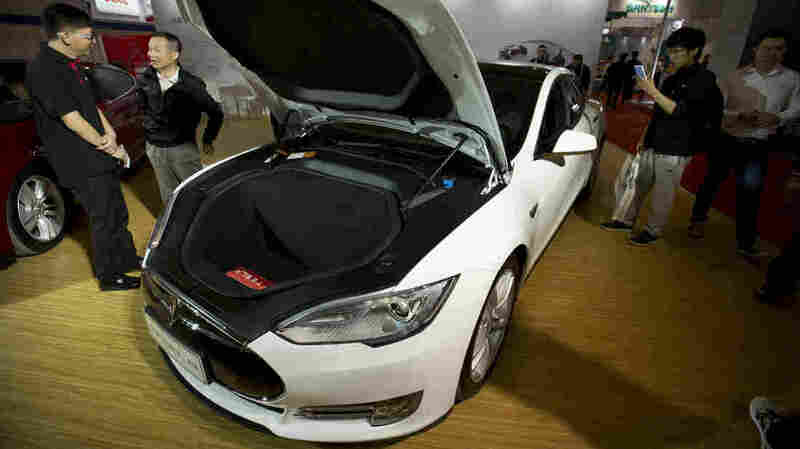 A Tesla Model S like the one seen here at an auto show earlier this year was in autopilot mode when it crashed into a tractor trailer. The fatal crash of a Tesla Model S car that was in autopilot mode when it collided with a truck on a Florida highway last month is prompting the National Highway Traffic Safety Administration to open a preliminary evaluation of the automatic driving feature. "This is the first known fatality in just over 130 million miles where Autopilot was activated," Tesla says in a blog post announcing the NHTSA plan. "Among all vehicles in the US, there is a fatality every 94 million miles." "What we know is that the vehicle was on a divided highway with Autopilot engaged when a tractor trailer drove across the highway perpendicular to the Model S. Neither Autopilot nor the driver noticed the white side of the tractor trailer against a brightly lit sky, so the brake was not applied. The high ride height of the trailer combined with its positioning across the road and the extremely rare circumstances of the impact caused the Model S to pass under the trailer, with the bottom of the trailer impacting the windshield of the Model S."
Discussing the man who died in the crash, the company's blog post says, "He was a friend to Tesla and the broader EV community, a person who spent his life focused on innovation and the promise of technology and who believed strongly in Tesla's mission." In the post, the company also extended its sympathies to the man's family. Neither Tesla nor NHTSA identified the man — but several media outlets, including Forbes, are reporting his identity as Joshua Brown, 40, an Ohio technology executive and former Navy SEAL who was in Florida when the fatal accident occurred. "NHTSA's Office of Defects Investigation will examine the design and performance of the automated driving systems in use at the time of the crash. During the Preliminary Evaluation, NHTSA will gather additional data regarding this incident and other information regarding the automated driving systems. "The opening of the Preliminary Evaluation should not be construed as a finding that the Office of Defects Investigation believes there is either a presence or absence of a defect in the subject vehicles."